As CANopen gains more and more popularity in the automation sector, the need is rising for truly capable and reliable instruments that can serve that expanding sector. WIKA has the answer: P-30 CAN. The P-30 CAN is a high precision pressure transmitter built completely by our experienced engineers in our production site in Germany. The highest quality standards are followed in all production steps, to ensure the reliability and quality of WIKA pressure transmitters. 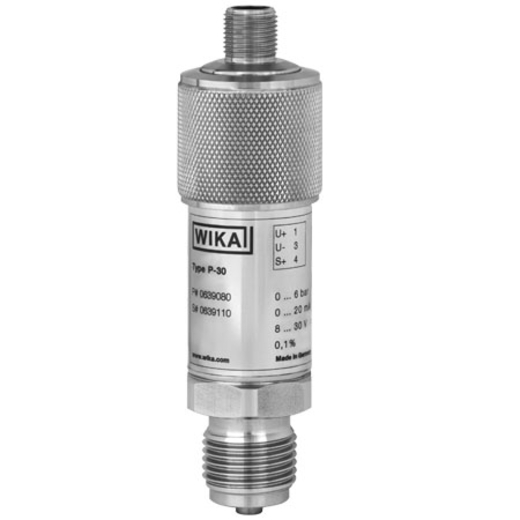 A combination of a reliable WIKA pressure sensor and premium electronic components, housed in a stainless steel case with high IP rating; makes the P-30 CAN ideal in test benches and test stands, in laboratories, in quality and testing facilities and even in the field of process control and automation. The P-30 CAN supports, among others, LSS, Node Guarding, Heartbeat, synchronous and asynchronous data transmission. The bit-rate can be adjusted from 10 kbit/s up to 1 Mbit/s.